As perhaps, the most recognized outfitters in industry, Everglades Kayak Fishing is proud to provide guided kayak fishing trips in the Everglades National Park and the 10,000 Islands. Leaving from Everglades City and Chokoloskee Island on dedicated kayak transport boats, anglers gear and guides are transported deep into the Park's core to fish the pristine waters of Everglades National Park for snook, tarpon, redfish, speckled trout and Spanish mackerel. Kayak fishing is the fastest growing segment of the sports fishing industry. Anglers have come to realize what a wonderful fishing platform the fishing kayak truly is. It provides stealth in shallow water unmatched by even the quietest of flats boats. With a fishing kayak, you have access to areas and to the fish that no others can reach. Whether fly fishing or fishing with traditional gear, kayak fishing it is a great way to sport fish while enjoying the beauty and wildlife of the Park. 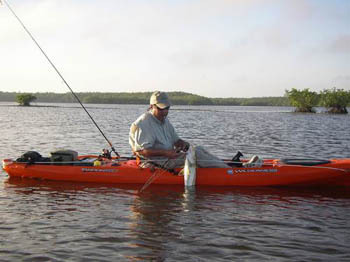 Everglades Kayak Fishing maintains a fleet of state-of-the art Heritage Redfish 12's and the Native Watercraft "Ultimate" (for the fly fisherman). Extremely stable and completely rigged for fishing, we provide you the best equipment available to safely access the remote, seldom fished areas of Everglades National Park. Everglades Kayak Fishing offers privately guided kayak fishing trips, regularly scheduled group trips and mother ship transport trips to the remote backcountry. Fishing kayak and equipment rentals are available as is a complete outfitting service for your single day or multi-day camping/fishing experience, as well. Whether accommodating a single angler, a family on vacation, or a corporate event, we have the experience, expertise and resources to make your trip to Everglades National Park, Naples, Marco Island or Everglades City a trip of a life time. Everglades Kayak Fishing . . . "Catch the Experience!"